This Pineapple Chicken Stir Fry with Bell Peppers is one of my favorite Weight Watchers recipes to make when I’m craving sweet, spicy and tangy! It’s also a great way to get in a lot of servings of fruit and vegetables. It’s colorful, fresh, and very satisfying. Each serving has just 3 Points each, making it a great idea for a healthy Weight Watchers dinner recipe. This is also a dish I like to make on days where I feel the need to eat a LOT. Because it’s such a low calorie, healthy recipe, I can really go overboard with this and not feel an ounce of guilt. There are even days where I’ve made my Pineapple Chicken Stir Fry Recipe and have eaten the whole thing! Yes, that’s right…all 4 servings. I LOVE it. Also, I’m obsessed with Frank’s Red Hot Sauce, so I use a lot of it in my version, but you can use as much or as little as you like. This pineapple chicken recipe is a much healthier alternative to sweet and sour chicken, so if you have a craving for some fast food sweet and sour chicken from your favorite Chinese restaurant, try this instead! 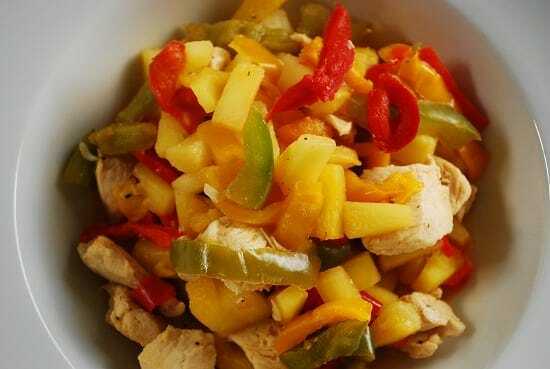 This light and healthy Pineapple Chicken Stir Fry with Bell Peppers is amazingly filling and yet still very low in calories and fat. I love serving this when I want a dish that is sweet, spicy and a bit sour. Spray a large non-stick skillet with nonfat cooking spray and set over medium high heat (about 5-7 minutes). Add in chicken, salt, pepper and oregano and cook until chicken begins to brown on all sides. Stir in the hot sauce and frozen pineapple tidbits, cover with a lid and let cook for about 5 minutes. Stir in the pepper slices, cover with lid and let cook for about another 5 minutes. Remove lid, turn off heat and let cool for about 2 minutes. I made this for my PICKY husband and mother who has serious aversion to all forms of spice (even salt and pepper) and they both loved it so much, my husband asks for it once a week! Thank you! My grocery stores don’t carry frozen pineapple. Can I use canned? Yes, just make sure to get the kind in it’s own juice, not syrup. And drain out all the juice first. I will use canned pineapple in juice – will rinse and drain first. Or use fresh cut up pineapple. This looks so good.